"You can't get real Thai food here anyways", exclaimed Grayelf while we were dining at New Age Chinese Cuisine. I completely agree. For as much as our food scene is full of Asian cuisine, most of it is tailor-made to the majority of diners. For instance, there are not a whole lot of people who can put up with the heat level from places such as Alvin Garden, Hotluck and Spicy Legend. I personally like spicy and even some of the offerings from the aforementioned restaurants destroy my tastebuds. Hence, imagine those who cannot take heat. So if you find watered down Thai food in Vancouver, don't hate. Just understand the restaurants are there to make money. Not to satisfy a small minority of people. With that in mind, finding good local Thai food is sometimes even more difficult as we head into the burbs. 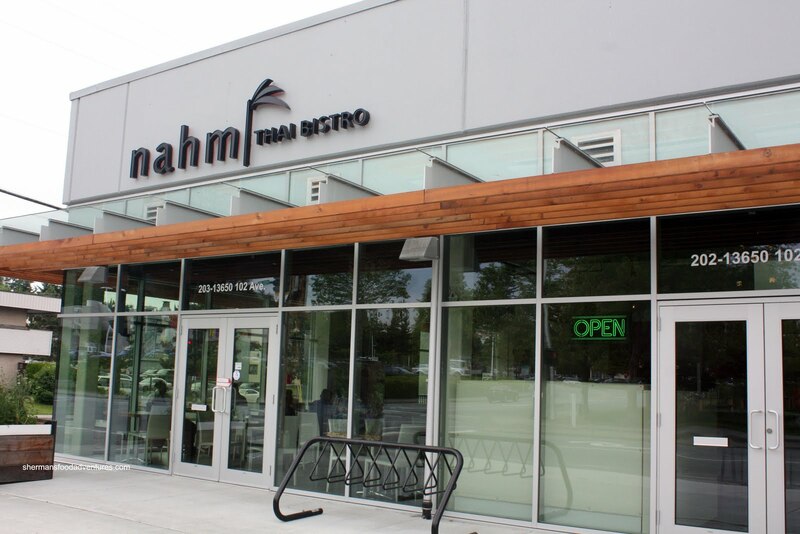 So imagine my curiousity when I found out about a new Thai bistro on 102nd and Whalley Ring Road. Not since the closure of Full Moon Laos-Thai has there been Thai food in this area. Luckily for me, Toolman was interested in joining me which would mean only one thing - more food! Well, and good company as well I suppose (this is just in case he is reading this!). Upon our arrival, we were pleasantly surprised that they had lunch specials. Initially, by the looks of their website, there didn't appear to be any. We ended up ordering 3 items to share starting with the Pad Thai with prawns. It arrived with lots of properly cooked prawns, pressed tofu, turnip, egg, ground peanuts and sprouts. So in terms of ingredients, it was legit. However, much like many Thai restaurants in the lower mainland, the sauce was ketchupy. Despite this, we still enjoyed it since the noodles were al dente and there wasn't an overabundance of s auce. 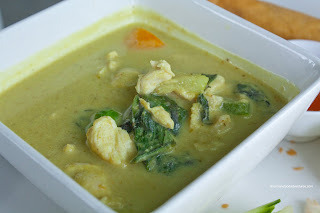 We also had a couple of curries starting with the Chicken Green Curry. We found it to be very mild and somewhat creamy from the coconut milk. There was plenty of chicken meat and basil which made it pleasant, if not unexciting, to eat. 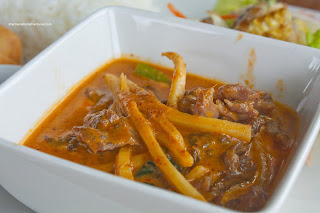 As for the Beef Red Curry, it had much more impact. It was significantly spicier (but still mild for us) and thicker with much more coconut milk. There was plenty of tender slices of beef with crunchy slivers of bamboo shoots and green peppers. We thought this curry was quite good. Lastly, each lunch special included rice (except for the Pad Thai) and a Spring Roll. I mean, what can I say about it... 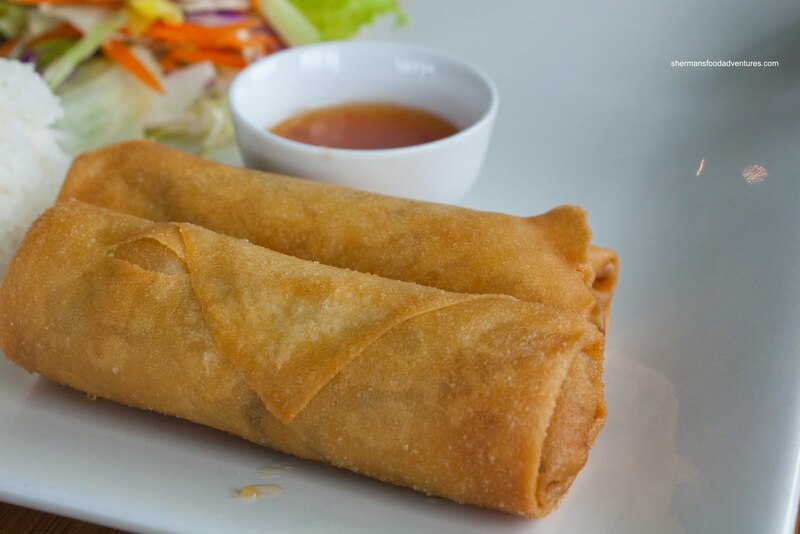 The spring roll was packed with cabbage and carrots while being fried up perfectly crisp. It wasn't too oily either. Pretty decent, much like the rest of the food. I'm sure some purists will do the "it's not authentic thing" again; but frankly I think that is unfair. Much like what Grayelf believes, I think that these Thai restaurants are only offering up what will appeal to the locals and what will keep them in business. 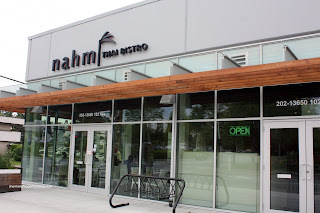 If we look at Nahm Bistro from this point-of-view, it is a pretty solid place for Thai food in Surrey at a reasonable price in a pleasing environment complete with great service. I will put on the Authenticity Police hat for pad thai with ketchup. There is absolutely no reason to do it. All the proper ingredients are readily available and pad thai made with ketchup just doesn't taste very good compared to a well made pad thai with tamarind. Of course the issue of gastronomic subjectivity will come up...but really - ketchup overwhelms everything you add it to and it tastes extremely processed. It doesn't even taste Thai...so why bother? Finally, I don't buy the notion that adding ketchup panders to the local palate...I think it is lazy, cynical cooking done my cut rate restaurateurs. Or: the scary thing is, some people actually prefer pad thai with ketchup. Must be mainstream: because Heinz now includes a pad thai recipe on their ketchup bottles. @JS Exactly what I meant. I don't prefer the ketchup kind myself, but for the majority of people it works. So the restaurants are in the business of doing business. NOT to satisfy a few people who want it authentic. I have been wanting to try this place since I first noticed it and think I will not. 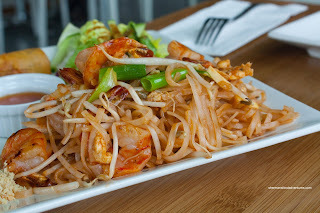 Thanks for the review on the pad thai! While I don't have the most distinguished palate, I LOVE, like LOVELOVELOVELOVE pad thai, and can tell the difference between authentic and the ketchup stuff, and fmed is right, it does end up tasting processed. So I guess my visit there is going to be pad thai free. sigh.